I was reading a book called the Transforming Journey and having coffee at the pool lobby, late this afternoon after swimming. I saw a little girl, she was so sweet and smiled at me and I asked her if she likes to draw. She said yes. I invited her to pick a postcard she likes from my `collection` ( I always carry around a selection of the Postcards you see here on this blog to give to people when the chance arises), and she picked one of the recent ones, the one in a post a few posts down with the SHALOM and the girl with the blue hydrangea ball and the scripture from Jeremiah 31. I asked if she wanted to draw something on the other side of the postcard. Her mom came near us and encouraged her. I gave the little girl a pen. The little girl was so shy at first. She could speak a few words of English, which surprised me as she is only 5, it was so cute how she said `Hi`. "Yes, I have loved you with and everlasting Love. The little girl really seemed to be listening attentively. She knows the word LOVE, as it was written on her t-shirt, and she then held up the postcard and tried reading the words herself!!! It looked like she was really reading it, you know how a child sometimes does that and sort of imitates an adult reading but she couldn`t really read it... except she did read LOVE and then she really wanted to read `everlasting` and made sounds for the other words, as if she was reading, her little lips moving so delicately. Even though she is only 5 and hardly speaks English it was as if these words from God`s Word were really speaking to her!! And she was wanting to `speak ` them out loud. It was such a sweet moment with her. I don`t have a photo, but if you can imagine, please do, can you see her, she is such a preciously drawn child of God! With her little black bangs and bob haircut and her hand holding the pen, as she sat kneeling at the low table and drawing all the things she knew how, and oh the grapes were sooooo sweet! I asked if she know what the `challah` shapes were, and she didn`t know, but then I told her its a kind of bread and they said it looks delicious!! 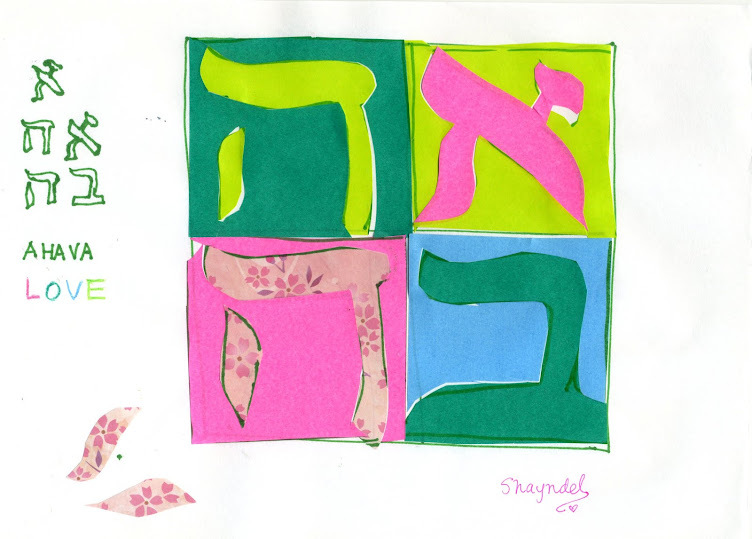 Then they recognized the challah in another drawing, so it was fun too to see that they learned a little that there is such a thing as challah. Very nice and touching. Thank you so much. A lovely story witnessing of the Holy Spirit's work. 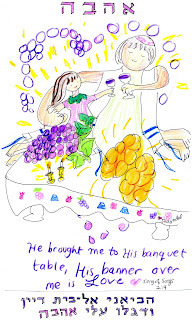 A beautiful drawing and scripture. His banner was over you, the little girl and the mother as you ministered God's love in the pool lobby. Shalom Shayndel each and every day. Thank you A.R.T. for visiting and reading the story. You ministered to me with your encouraging words and comment. Blessings and Shalom to you too in every day! I particularly enjoyed this story because my oldest granddaughter, Susanna, share an art journal that travels from our homes to each other! Sometimes I include a scripture. Once, I traced my hand across the page with these words: See, I have written your name on the palms of my hands. ISA 49:16a. I am always looking for ideas, too! God bless and keep you, Shayndel. I love moments like these! If we just open our hearts and minds he is all around us. It makes me sad that some people can't see his hands in things. The other day a famous actress who is Jewish made a facebook post that yes , she believes in God and she blieves in sciense as she is now a scientist. She said that God is science and I would agree with that, but it made me said that she said, but no I don't believe if you pray for God to help you with something such as finding your keys or somethign else that he will help you. It makes me sad that she doesn't think he can't help with the simplest things such as finding keys. I think he is capable of helping us with big and with the little things. I am glad you had this sweet exhange. May God watch over and protect you all your days. Thank you for having the courage to share his message. The ability to draw a picture is a God's given gift.You've certainly got it, and should ever be thankful to Him for that. The story with the girl and her Mum is precious; it represents the young generation of gifted people, those of lucky God given abilities in life. Thank you Duta! Yes, I am thankful! Just hope I can use the gift well and bring Glory to Him. I am glad you enjoyed the story about the girl. I know that not all parents encourage their children`s creativity, and that is so important and life-giving to a child, so I was happy to see the mom so involved and encouraging. Many blessings to you and may you use all your gifts every day for God`s glory!! You have a special gift for encouraging and seeing the good in people and that really is a wonderful thing, and so nourishing to the one who receives it!! I know you have many more gifts too, but that is one that shines thru always in your posts and comments! !Blessings and Love! This is such a sweet story and what a wonderful opportunity to witness to the little girl and her mother. It seems the HS gave you your last drawing just before you met the little one. 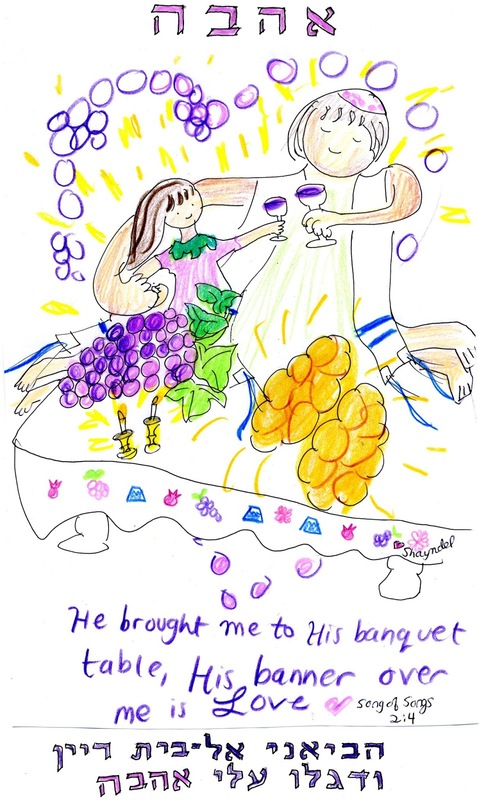 It perfectly captured the little girl's desire to know of an everlasting love. Wonderful!